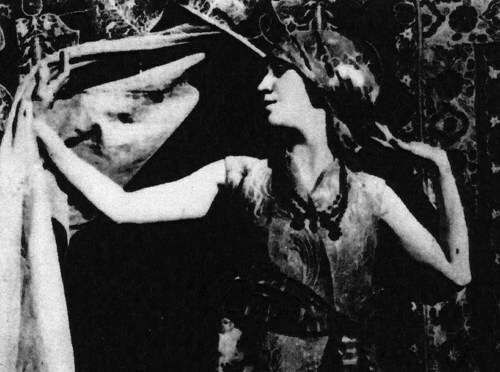 The development of modern dance in the United States began in the 1890s with Loie Fuller and, most famously, in the early 1900s by Isadora Duncan. They were moving away from the strictures of ballet to a more interpretive style of dance. About the same time, Duluth-native Emily Schupp was beginning her fascination with dance. She would later develop her own style of interpretive dance and became one of the pioneers of that art. Emily Victoria Schupp was born in Duluth on May 24, 1888. Her parents were William Schupp and Amelia Victoria (Kugler) Schupp, both born in Michigan. William’s father was a banker in Saginaw, Michigan, and William got involved in business when he moved to Duluth around 1885, working first as a bookkeeper for Duncan, Gamble & Co., a logging and lumber manufacturing company. He later partnered with Wendell Mosher in the Mosher & Schupp insurance agency. He started his own agency, William Schupp Insurance, about 1899, and sold it in 1905, shortly before leaving Duluth. Emily’s mother’s family, the Kuglers, were early residents of Duluth, having arrived in the Zenith City by 1873. The father, Ernest, worked as a butcher, and later with his son Frederick, a pharmacist, owned F.W. Kugler & Co., a drug store at 127 East Superior Street. Amelia had a sister, Victoria Henrietta, who was born in Duluth on March 24, 1874. Victoria, who went by Henrietta, later married Duluthian Henry Nesbitt and the couple eventually worked in Franklin Roosevelt’s White House. A pioneer resident of Duluth, Ernest died in his drug store on July 17, 1903. Schupp attended public elementary schools in Duluth and later spent at least one year at Craggencroft School, a private preparatory school for young women. Concerned that Schupp was spending too much time practicing piano and voice, her mother encouraged her to take up dance to get some exercise. It eventually became her obsession. In her early teens, Schupp and her mother spent two years in Europe studying music. When they returned to Duluth, her mother felt a public education would do Schupp good, so she spent the 1905–06 school year at Central High School. She continued studying the piano with Mrs. Stocker and participated in numerous recitals. About 1906 Schupp’s parents left Duluth for Canada and she spent the next year in Washington D.C. attending the Bristol School, another preparatory school for girls and young women. She returned to Duluth in June of 1907 and spent the summer with her aunt, now Mrs. Henry Nesbitt, in their home at 224 Fourteenth Avenue East. About this time, Schupp was ready to commit herself to dance, so she and her mother began a three-year period in Europe, studying the folk dances of Russia, Hungary, Poland, Italy, Sweden, Norway, and Germany. They returned to Duluth for Christmas of 1910 to visit Henrietta Nesbitt. While in the Zenith City, Schupp performed folk dances for about 50 guests at a private home. In January of 1911 she returned to Russia to continue her studies. Her art is of the same school as Isadora Duncan’s, but more romantic and less classical in detail. Miss Lada has an unusual sense of rhythm and the imaginative gift. She is light and graceful, temperamental and poetic. That summer Emily made her first professional dancing appearance in Duluth. The occasion was a performance to help rebuild the College Hall at Wellesley College in Massachusetts, where several Duluth women were enrolled. For that benefit, Emily performed six dances at the Orpheum Theater on July 21, 1914, to an enthusiastic crowd, according to the Duluth Herald. Emily continued to dance professionally for the next few years, mostly in the United States and Canada. During 1916–17 she danced with the Russian Symphony Orchestra on a thirty-five city American tour. She appeared solo in some southern states in May 1917, and followed that with a two-month tour in South America. In one performance she appeared in full American Indian war regalia and danced to Charles Skilton’s Indian Dance (she was perhaps inspired by her childhood music teacher, Stella Stocker). Schupp would perform at Carnegie Hall several more times over the next few years. By 1917, Emily’s father William had become wealthy from his business interests and had purchased the Canadian Whaling Company and the American Whaling Company. He relocated the companies to Bellevue, Washington, as the American-Pacific Whaling Company, which soon became the largest whaling business on the West Coast. He also purchased a farm on the Hudson River near Staatsburg, New York. The family named it Pawling Manor and Schupp made it her home. She had a dance studio built there so she could practice. When Emily traveled to performances, she was always accompanied by her manager, Marc Lagen, and her Great Dane, Queen Bess, who was said to always bark vociferously at Emily’s photograph on advertising posters. Schupp continued to dance professionally for a couple more years, touring mostly in the United States. Her mother died on January 20, 1922, in Rochester, Minnesota. Schupp married her manager, Marc Lagen, on July 7 of that year. They had one child, William Schupp Lagen, who would graduate from the U.S. Naval Academy. Schupp essentially retired when William was born. In 1925, the Lagens moved to Seattle, and later to Bellevue, Washington. Marc worked for his father-in-law’s company, eventually taking over management of the firm. Marc Lagen died in Bellevue on March 28, 1946. Schupp eventually married William Grill, the family’s attorney. She died in Bellevue on July 31, 1964.